Farmers and ranchers take home just 11.4 cents from every dollar that consumers spend on their Thanksgiving dinner meals, according to the annual Thanksgiving edition of the National Farmers Union (NFU) Farmer’s Share publication. The popular Thanksgiving Farmer’s Share compares the retail food price of traditional holiday dinner items to the amount the farmer receives for each item they grow or raise. Did you know that farmers and ranchers receive only 15.8* cents of every food dollar that consumers spend on food at home and away from home? According to USDA, off farm costs including marketing, processing, wholesaling, distribution and retailing account for more than 80 cents of every food dollar spent in the United States. 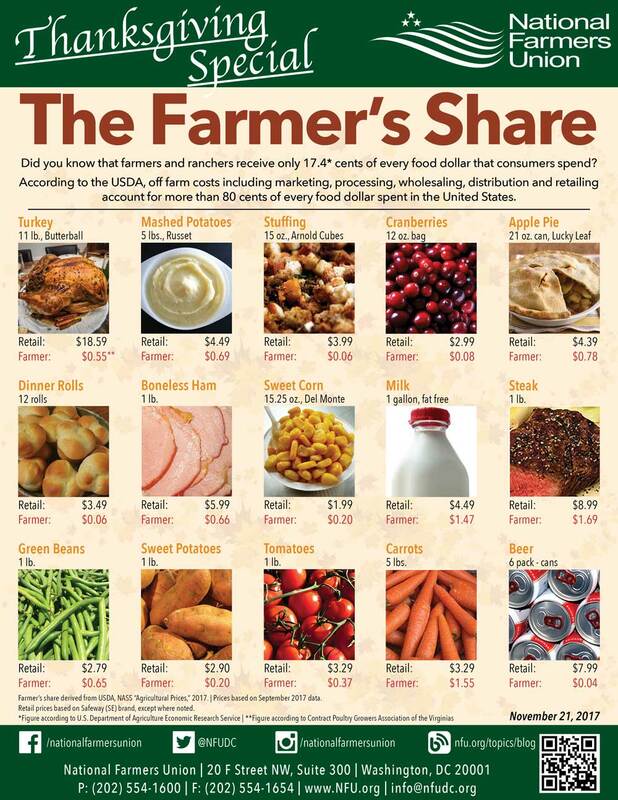 Farmer’s share derived from USDA, NASS “Agricultural Prices,” 2014. Retail based on Safeway (SE) brand except where noted. Download the latest version of the Farmer’s Share here.